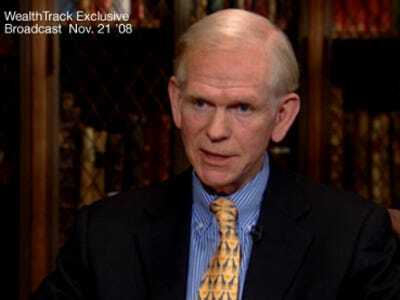 Here’s the latest market prediction from the legendary Jeremy Grantham of GMO. Jeremy still puts fair value on the S&P 500 at ~900–a healthy 30% below today’s level of ~1300. This assessment is similar to that of many other value-conscious investors, including John Hussman and Robert Shiller. But this is “Year 3 of the Presidential Cycle,” Jeremy says. And, historically, “Year 3” has been good to stocks because the government does everything it can to help get itself re-elected, including flooding the economy with cheap money. And interest rates are still fixed at near-zero, Jeremy notes. And, usually, emerging bubbles don’t burst until rates are rising. So enjoy the ride until October, says Jeremy. Then sell everything and head for the bomb shelter. So, where are we now? Although “quality” stocks are very cheap and small caps are very expensive (as are lower quality companies), we are in Year 3 of the Presidential Cycle, when risk – particularly high volatility, but including all of its risky cousins – typically does well and quality does poorly. Not exactly what we need! The mitigating feature once again is an extreme value discrepancy in our favour, but this never matters less than it does in a Year 3. This is the age-old value manager’s dilemma: we can more or less depend on quality winning over several years, but it may well underperform for a few more quarters. We have always felt we should lean more heavily on the longer-term higher conﬁdence. As a simple rule, the market will tend to rise as long as short rates are kept low. This seems likely to be the case for eight more months and, therefore, we have to be prepared for the market to rise and to have a risky bias. As such, we have been looking at the previous equity bubbles for, if the S&P rises to 1500, it would ofﬁcially be the latest in the series of true bubbles. All of the famous bubbles broke, but only after short rates had started to rise, sometimes for quite a while. We have only found a couple of unimportant two-sigma 40-year bubbles that broke in the midst of declining rates, and that was nearly 50 years ago. The very famous, very large bubbles also often give another type of warning. Probably knowing they are dancing close to the cliff and yet reluctant to stop, late in bubbles investors often migrate to safer stocks, and risky stocks betray their high betas by underperforming. We can get into the details another time, but sufﬁce it to say that there are usually warnings, sometimes several, before a bubble breaks. Overvaluation must be present to deﬁne a bubble, but it is not a useful warning in and of itself. I fear that rising resource prices could cause serious inﬂation in some emerging countries this year. In theory, this could stop the progress of the bubble that is forming in U.S. equities. In practice, it is unlikely to stop our market until our rates have at least started to rise. Given the whiffs of deﬂation still lingering from lost asset values, the continued weak housing market, weak employment, and very contained labour costs, an inﬂationary scare in the U.S. seems a ways off.